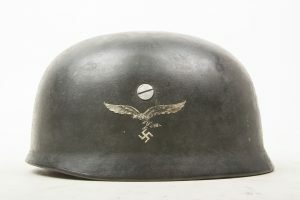 A very nice single decal Fallschirmjäger or paratrooper helmet. The helmet is in very good condition and complete with its original liner, chinstrap and bolts. 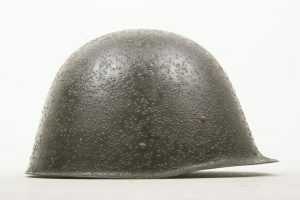 The helmet still retains up to 90% of its wartime paint and decal. Nicely marked ET66 indicating production by Eisen- u. Huettenwerke, Thale, Harz. The helmet is a size 66 shell with a size 54 liner. The liner is supple and in good condition. 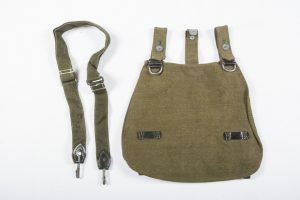 The straps are also supple with functional snaps and buckle. The helmet would be a great addition to any helmet collection! 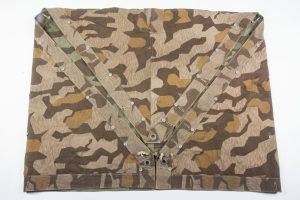 This is a very nice and unissued straight shovel carrier marked gxc44 indication production by Adam Reinhold, Sattlerwaren Fabrik, Oberursel (Taunus). This is one of the best ones I’ve ever seen and would be very hard to upgrade! A nice matching pair in very good condition. The pair is maker matching marked RBNr. 1/1009/0095. The pouches are complete with all internal dividers. 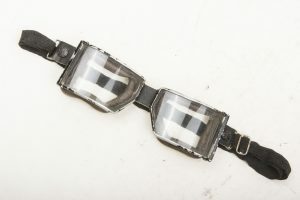 Very nice and scarce to find late war Ultrasin pilots goggles complete with their original case. 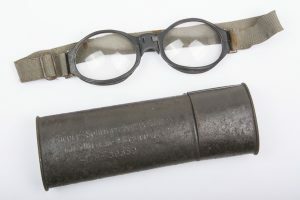 These late war plastic based Splitterschutzbrille or splinter protective goggles where meant to be worn with the leather flight helmet. Incredibly scarce to find in good used condition and complete with their case! Minty and extremely scarce M35 ET62 double decal Kriegsmarine helmet. 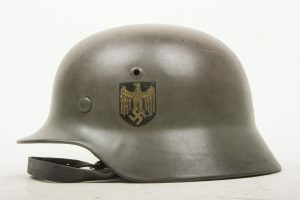 This helmet is a stunning and prime example of a near mint Kriegsmarine double decal M35 helmet. These helmets are extremely scarce as the three colour national shield was ordered removed very early in the war. The helmet retains its textbook ET Kriegsmarine decal and national shield up to 99%. The original paint surface on the helmet is smooth and still retains up to 99%. The helmet retains its original untouched liner with 3 tight liner pins all with full original paint. The helmet would be a prime piece in any Kriegsmarine collection! For sure the best Kriegsmarine I’ve had to offer! 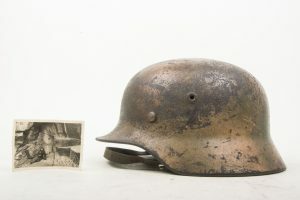 Stunning original M40 Luftwaffe helmet in three-tone Normandy camouflage with a sweetheart picture found in the liner. The helmet retains up to 80% of its original camouflage paint and its original liner and chinstrap. The helmet is marked Q66 indicating production by Quist. The liner is nice size 58 and original to the helmet. I looked inside the helmet and felt a piece of paper behind the leather of the liner. The picture of a Nachrichtenhelferin named Irene was tucked inside; most probably his sweetheart as a good luck charm. The helmet is named to Obergefreiter Brandt in the skirt of the helmet and the liner. 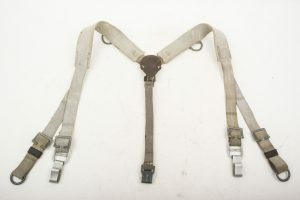 The chinstrap is a nice early brown LBA marked example with aluminum buckle. The helmet is a very nice example of a three-tone camouflage helmet with a very nice extra that I found inside! 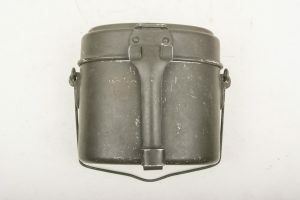 A suberb original Heer EM/NCO M43 field cap marked RB-Nr. 0/0560/0461. 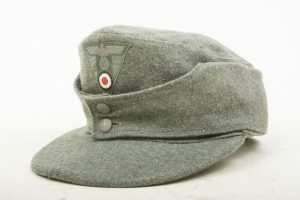 The cap is a desirable size 56 and in stonemint condition. 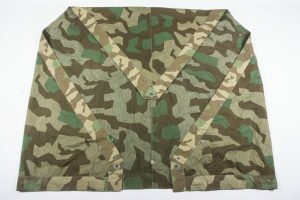 The cap retains its factory sewn trapezoid machine sewn at the top, folded over and machine sewn down the sides. 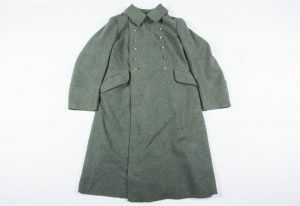 The buttons are also factory sewn. The cap does not show any signs of actual wear. The nap of the wool is still present 100%. A nice and textbook detail in this cap is the stitching lines in multiple colours, running all over the place like it should in a late war manufactured garment. Surely the best Heer M43 cap I’ve had to offer in stone mint condition! 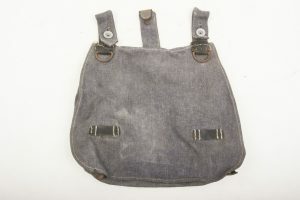 A very nice, late war breadbag with riveted buttons on the top. Nicely RBNR marked on the middle support strap. I’ve never seen these riveted buttons before! 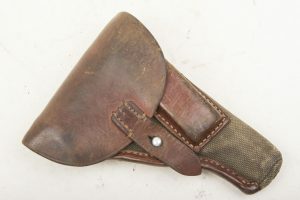 Rare German made holster for the P.37(u) Femaru. 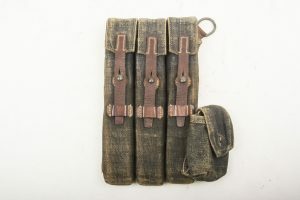 The holster is constructed from a mix of webbing and leather. 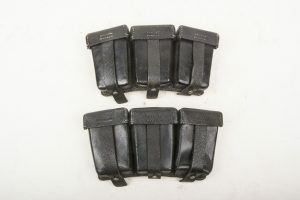 These holsters are sometimes referred to as being tropical issue as these first came at the same time with the webbing equipment. 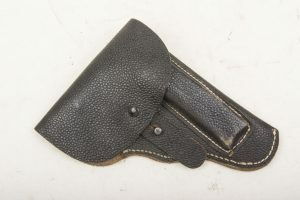 The holster is in very good condition and nicely marked cdc 41 indicating production by Kern, Klager u. Co., Lederwaren, Berlin. 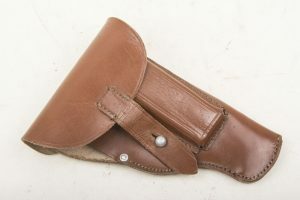 The holster was also used and worn with the P.27(t). A nice untouched helmet, dusty, as found. The helmet retains its original liner and chinstrap. 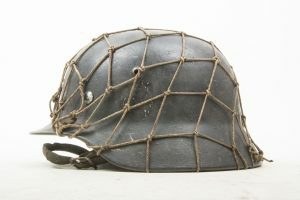 The helmet features a rough period overpaint and a period applied helmet net. The helmet shell shows a Heer decal peaking through the paint under the net. Without a doubt this helmet has seen a lot of action during the war. The helmet net shows a lot of interaction with the border of the helmet and the net. The helmet net has been on this helmet a long time! A classic yet very hard to find a original period netted helmet. 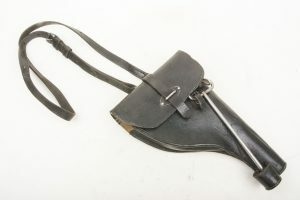 Complete Presstoff holster with its original sling and cleaning rod. 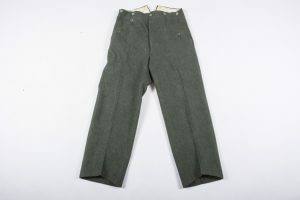 The pouch is nicely marked and dated 1940, the cleaning rod is marked GL38. The bottom cup for the cleaning rod has a crack in the Presstoff, otherwise it is void of any damages. The set is in very good near mint condition. Hard to find complete set! 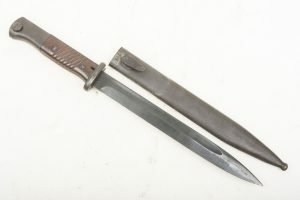 A very nice original PUMA combat boot knife or Nahkampfmesser or officially; Infanteriemesser 42. The handle is made out of typical red speckled bakelite. 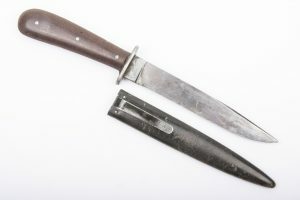 The knife is in good sharp condition and has been used and issued! Perfect combat mannequin accessorie! 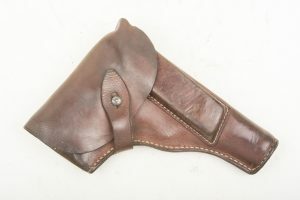 A very nice brown Pistole 35(p) Radom holster. The holster is in good lightly used condition. Inside its nicely initial marked and marked bnz P35(p) 1943. 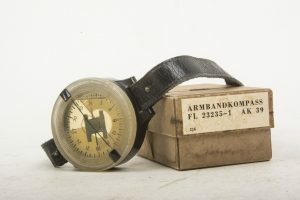 Nice Luftwaffe wrist compass or Armkompass 39 (AK39). The compass is in mint and working condition with its often missing original strap and its original factory box! The base material of the compass is in good, clear condition. Hard to upgrade mint piece in its original factory box! 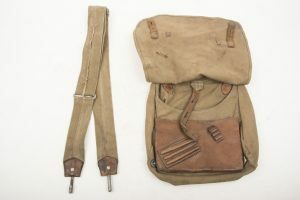 M40 Heer/Waffen-SS Brotbeutel marked RKS42 with matching strap. Perfect and mint. Very nice field repainted Petrix 677 flashlight in good used condition. Interesting detail is that this one has a nice green field repaint, as common with helmets and gasmask canisters. First time I see it on a flashlight though. Nice personal item. 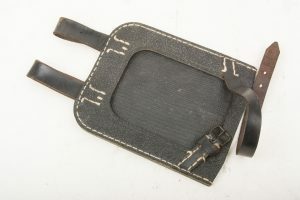 A nice example of a Bluegrey MP40 magazine pouch. 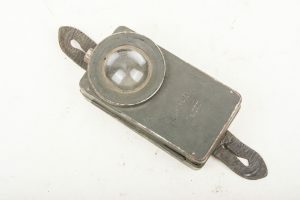 Marked on the back gmk42 indicating production by Kroymann & Co. GmbH , Schuh- u. Sportartikel-Fabrik in 1942. The pouch is in very good condition and the brown leather straps are nice and supple. 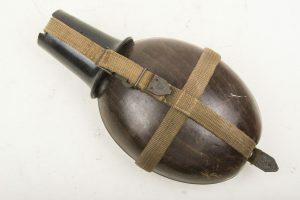 A nicely used coconut canteen marked HRE 42 indicating production by Heinrich Ritter, Esslingen. The canteen is in good used condition together with its bakelite cup. Hard to upgrade textbook coconut canteen!